Caboto's trip of 1497, and his reports of waters so full of fish that could be collected with a simple basket, led countless fishing boats to sail to the New World. Coming from Portugal, France, Spain and England, they joined the Indigenous Peoples who already knew very well the reward that could be found on the eastern shores of North America. The currency that I present today is the second in a series dedicated to the History of Canada and refers to the Arrival of Europeans. Giovanni Caboto, Italian navigator, merchant and explorer is considered one of the first Europeans of modern times to arrive in 1497 to the continental part of North America. With him began the commercial exchange with the new world. 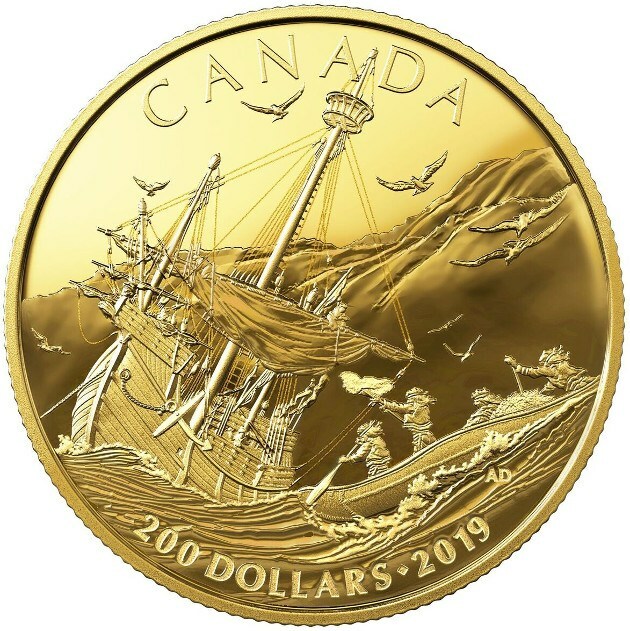 Canadian artist Alan Daniel has created an impressive visual narrative of a commercial exchange, where Micmac Indians row to meet a Portuguese ship caught in a summer storm on the coast of modern-day Nova Scotia. His canoe is full of skins and a man shakes an animal skin to indicate his desire to trade. The experience of the Micmac as sailors is reflected in their skilfully designed canoe, which has curved sides and high ends designed to avoid rough seas. 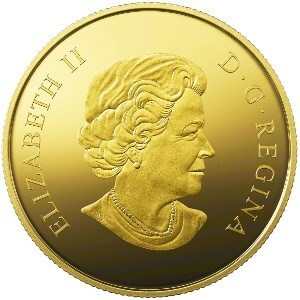 I think no one can doubt the great beauty of this gold coin, another issue is the price, 1,200 Canadian dollars, about 800 euros to change. 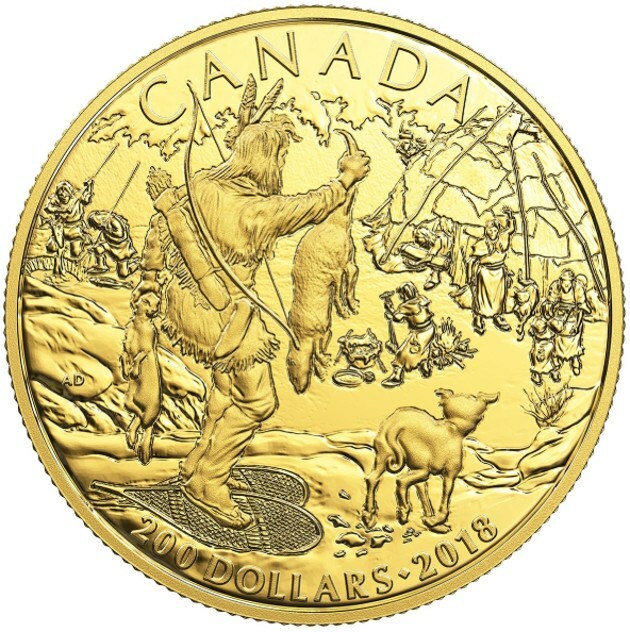 As I said this is the second coin of the series, I leave you image and description of the first, which is also a true work of art and has the same characteristics. The history of Canada extends for millennia, and this currency transports us in time to the First Peoples of Canada. The Algonquin people were one of the countless communities that existed in North America long before the Europeans arrived. These indigenous peoples lived in perfect harmony with nature, moving to the rhythm of the seasons to access new sources of food and find refuge from the treacherous climate suffered by the Great Lakes in winter. The Canadian artist Alan Daniel has created an impressive visual narrative of an Algonquian hunter who returns to his winter camp with a rabbit and an otter. Your community greets you with enthusiasm as these animals will provide food and precious materials to make clothing and tools, some of which may trade with other indigenous peoples next spring. Two descriptions of daily life are also included in this design: two men who fish in the ice and a woman who prepares an animal skin. I hope you liked these coins as much as I did.